The Lost Woods is one of the more well-known recurring overworld regions in the Zelda series. First appearing in the original Legend of Zelda, the Lost Woods have become a mainstay in the landscape of Hyrule, alongside Death Mountain and Lake Hylia. In most appearances the player is required to journey through the Woods in a very specific pattern to make it to the other side safely. If this pattern is not completed correctly, the Woods will often repeat or simply send the player back to the start, thus causing the player to become lost or disoriented. Appearing at first as little more than another forest for Link to wander through on his journey, the Lost Woods often take on the shape of a maze or labyrinth of trees. 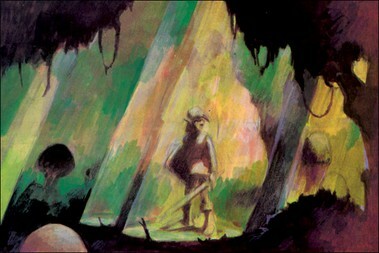 Later depictions had it as a dark and very heavily overgrown forest complete with hollow log tunnels and secrets and dangers scattered about. The woods sometimes function as a puzzle or mini-dungeon to complete as a part of the greater journey. Often the Woods hide the road towards the Forest Temple, or contain the long forgotten Master Sword. Along the way there have been various creatures or people found within the Woods. Skull Kids and Deku Scrubs are commonly encountered within them in many games, as are human thieves. In a couple of cases, the Lost Woods feature in the lore of the setting itself, adding to the already abundant mythology of Hyrule. There have been multiple changes to not only the design but the overall purpose of the Woods throughout the years. The Lost Woods might only appear as a small location on the map that only serves as a brief stop, or it could be much more important to the storyline, guarding a more important location or obscuring the path to another region. 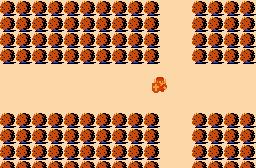 In the original Legend of Zelda, the Lost Woods were nothing more than a puzzle; a single screen with four possible paths just west of the starting point in the brown trees that would endlessly repeat in three directions until the player discovered the formula of north, east, south, east, to move through them. Often players would avoid it completely by going around or using a warp. No explanation was given for the occurrence or why this region was placed in Hyrule. It was just another enchanted section in an already magical world. In A Link to the Past, the Lost Woods took on the appearance of a much larger and denser forest in the far northwest corner of the map. It no longer had any directional puzzle attributed to it, but it maintained the same enchanted feel by having a magical fog hovering over it that kept the visibility low in the early parts of the game. Many inhabitants were added to it, such as thieves and lumberjacks, as well as many animals living deep within the forest. A thieves’ hideout was added with an extra minigame for Link to take part in. If the player was not careful, the thieves hiding out in the forest would steal his items. An extra level of importance was added to the forest by having it be the resting place of the long-hidden Master Sword, located in an inscribed pedestal within a small sacred grove. 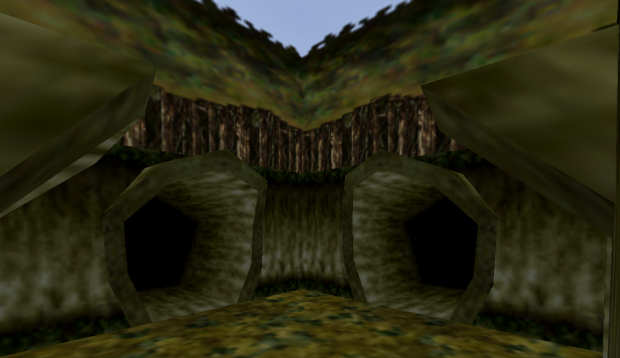 In Ocarina of Time, the Lost Woods were once again moved to a separate corner of the map, and the familiar direction puzzle from the original game also returned, although, like the Lost Woods itself, was greatly expanded upon. This time the Woods was not just a screen, but a lengthy maze of various rooms connected by hollow logs. Much like the first appearance, choosing a wrong path lead Link back to the beginning. Along with its sheer size, there were many more additions to the Woods, like new minigames to play, Business Scrubs to purchase items from, and unique inhabitants not found anywhere else. The Woods connected the Kokiri Forest to the Sacred Forest Meadow, the hiding place of the Forest Temple. 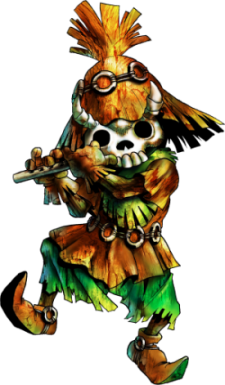 The mythology of the region was also expanded greatly in Ocarina of Time. In this game the Lost Woods take on a much more sinister role as a place where non-fairy beings that wander within its twists and turns mot only find themselves hopelessly lost, but are cursed to transform into Stalfos. The Skull Kids you encounter a few times within the forest are rumored to have been children that entered the forest and were transformed as a result of getting lost themselves. In Four Swords Adventures, the Lost Woods appear as a stage but without the identical repeating area. The nature of the Woods’ puzzle this time around is that each screen looks very similar and it is very easy for the players to become lost as a result. The Deku Scrubs that inhabit these woods inform the player that they have a similar curse as to that of the Skull Kids and Stalfos of Ocarina of Time; they were Hylians that entered the woods and were transformed through the power of the Lost Woods. In later appearances, the importance of Lost Woods lessened somewhat. In The Minish Cap, the Woods are a forest of dead trees that Link must traverse on his way to the Royal Crypt. The puzzle aspect is absent, due to a series of signs showing the player where to go. In Spirit Tracks, the Woods return as a maze that must be traversed by train. In this game, Link immediately fails at finding the way through and must venture to the local village to learn how to travel through the forest. Once completed, the player never again needs to travel through the maze. The concept of an enchanted forest is not new to storytelling; many myths and fairytales have included mysterious places very similar to the Lost Woods. Often they would be cursed or protected so that anyone found entering them would encounter something supernatural. Forests often represented hidden or unknown places that many rare and dangerous creatures roamed. They were areas that people did not often enter, and could be inhabited by monsters, witches, fairies or ancient beings. Folktales of fairies causing travelers to become disoriented or lost in what would otherwise be a familiar area is common in some countries. Certain retellings of the story have led to the use of the term “Pixie-led”, meaning lost or misled off a course by supernatural means. Often this would be the result of a fairy or witch magically confusing the victim into losing their way and aimlessly wandering, often for days. In some occurrences they would drift aimlessly until they died. Even in modern day we have stories of mysterious locations where travelers become lost, such as the Bermuda Triangle, which has been said to cause sailors and pilots alike to lose their bearings and become lost. There have been rumors of compasses and radios ceasing to function, giving a modern day mythology to the region that it is a cursed or forbidden area. This very same fear of the unknown still gives rise to tales of cursed or haunted locations that people are still afraid to trespass in today. Mysterious forests that ensnare or bewilder adventurers are also found in modern literature. The well-known Lord of the Rings series had a few such forests. The great forest surrounding Lothlórien, a home of the elves in Middle Earth, was protected from evil by the magic of its rulers. Passage of time was also slowed within it, causing the trees to grow but not die. Evil creatures were incapable of entering the forest or finding their way to the inhabitants due to the protection. But even much more alike to the Lost Woods of Zelda is a forest that appeared in the Silmarillion, titled the Girdle of Melian. This forest was used as a protective barrier surrounding the kingdom of Doriath, enchanted by Queen Melian. Whomever stepped into the forest became hopelessly lost in an endless maze of trees until their food ran out and they died. With all the in-game mythology attributed to the Lost Woods, there has so far never been an explanation or origin given to the area. This leaves the players to wonder what might be the ultimate purpose for the region’s existence. Where did the enchantment come from, and why can it transform unsuspecting Hylians into monsters? Many game theorists have suggested it is indeed a protective barrier of some kind, that the lost woods are meant to keep unwanted outsiders away from some specific item or being. This explanation could indicate protection of a variety of things, as many sacred or important things are hidden within the forested locations of Hyrule. A prominent assumption is that it is meant to separate the main countryside of Hyrule from the sacred forest and protect the Great Deku Tree and his Kokiri children. Or that it is used to keep the Forest Temple hidden and safe from outside forces. 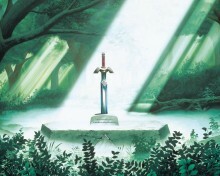 Another possibility is it’s to protect the Master Sword, which has been kept deep in the forest a number of times in the past. There have been so many extraordinary items and locations hidden within the forest that it might be difficult for one to decide which one is the cause for the protective barrier. Another speculation is that the Lost Woods are not protective or beneficial in any way, but cursed by some outside source. The fact that all non-fairy folk who enter are doomed to wander until they become Stalfos contribute to this assumption. The words of the Deku Scrubs of Four Swords Adventures — mentioning that they have been transformed by the woods into their current forms — shows that they share a similar fate as the Stalfos and Skull Kids. It has even been conjectured that since the Demon King Demise was once sealed within the forest of Hyrule, that his essence might have tainted the land. Along with other notable locations commonly found in each new journey through Hyrule, such as Death Mountain and Lake Hylia, the Lost Woods have continually evolved in both size and purpose. Sometimes it gains importance and has a huge impact on the story, and sometimes its importance wanes and it’s only another puzzle to overcome. Nevertheless, the Lost Woods still remain a very interesting element of mystery in the constantly changing land of Hyrule, and as a common concept in not only Zelda but in myth and fiction overall, I have no doubt it will continue to be in future sequels. Author: DjinnDjinn has been a member of Zelda Dungeon for a little over a year and frequently writes articles for the article staff. He also works as a news correspondent and is an active member of the forums. He has been a fan of the Zelda series for many years now and you can view his creations over on his Deviantart.